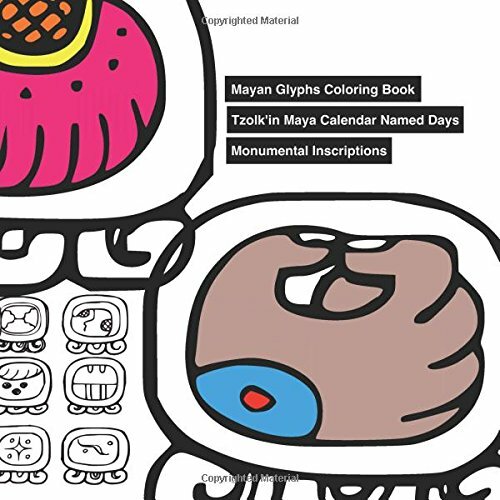 Tzolk'in Maya Calendar Named Days Coloring Book. The Tzolk'in (also commonly written Tzolkin) is the name commonly employed by Mayanist researchers for the Maya Sacred Round or 260-day calendar. It is generally considered by most Mayanists and Mesoamerican researchers to be the regions oldest calendar count. In the Tzolk'in, there are twenty named days in thirteen named periods of time. Similar to our modern calendar system having 7 named days, Sunday through Saturday, in a period of time known as a week; The Tzolk'in calendar combines a cycle of twenty named days with another cycle of thirteen numbers (the trecena), to produce 260 unique days (20 × 13 = 260). Unlike our modern calendar system, however, so important were the named days to the ancient Mesoamericans that each was associated with its own particular deity and given a glyph within their respective language. This coloring book offers the 20 days used in the Tzolk'in along with their associated deity and glyph or "Day Sign" in the monumental inscription style. The Mayan used many beautiful colors in their scripts and art. Unfortunately, the color has faded away over the centuries. Let's put the color back to the Mayan named days!